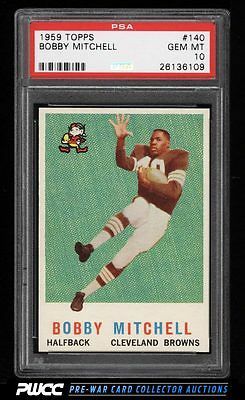 Absolutely gorgeous Mitchell rookie on the auction block this month. The offered specimen is one of only four to reach the elusive PSA designation and is surely the best example of those four. A perfect card from every angle; boasts 50/50 centering with four pin-point sharp corners and undeniable GEM MINT card stock. The edges are completely fresh and the surfaces are brilliant. A spectacular card which is only worthy of the best collection. One of nearly 17,000 cards, lots, and sets up for bid in our 8th Auction of 2016. Click on the link above to view the other PWCC auction lots.